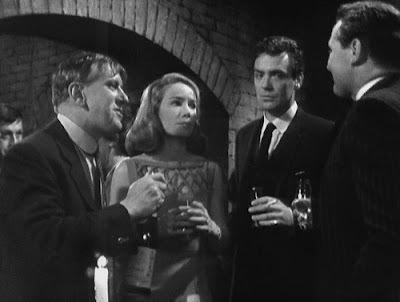 Wine seems to go down quite well in The Avengers (2.11 Death of a Great Dane, in which Cathy gets a bit blotto), and if The Secrets Broker isn’t quite of that vintage, it does involve a winning ruse (spiritualist séances as a cover for the passing of secrets) and several first rate performances, from Patricia English, Avice Landone and the inimitable, irrepressible Jack May. 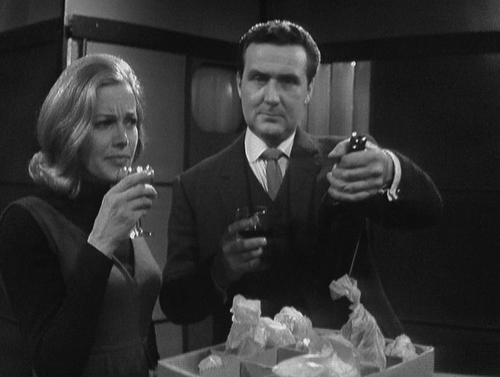 Steed: I’m, uh, going to a wine tasting party. Cathy: Do you really think you’ve got the palate? 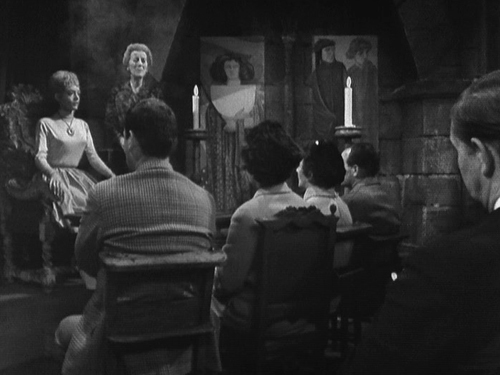 May is Waller, the ringleader, but the group’s steeliest and most imperious member is Landone’s Mrs Wilson, effortlessly single-minded and callous whereas May, posing as the manager of a wine shop, is given to sucking a cigar and engaging in broad banter with Steed. “Wine and spirits” was probably the dubious connection that inspired writer Ludovic Peters (his only contribution to the show), and it works reasonably well, if entirely randomly, a sign of the eccentric arrangements that will become the norm. Mrs Wilson: You think us fakes, yet we know so much about you. 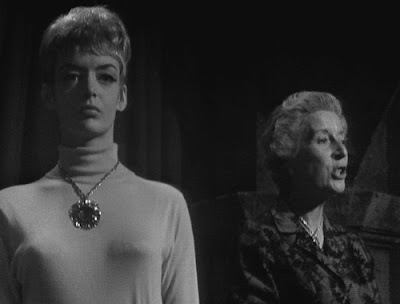 The actual business being investigated is rather by-the-by, and not terribly intriguing, with a fairly involved plot in which two brothers, Frederick (John Stone) and Allan Paignton (Ronald Allen) are pressured into murder and theft (via instructions given at the séance; analysing quite why the séance is necessary will probably get you nowhere, even if adds to the heightened milieu). 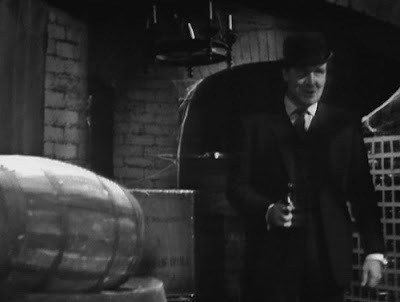 The wine shop produces a wine list that includes part of plans for a breach mechanism for an anti-tank gun; again, the intricacies of this are elusive (Steed surmises the full plans aren’t held so the instigators can’t double cross each other). Cathy: (presented with a bottle of apricot brandy) What makes you think I have depraved tastes? 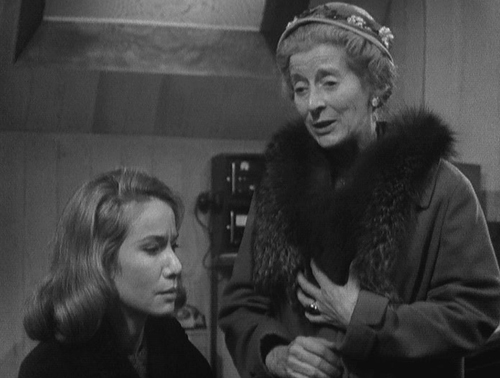 Steed: I can’t imagine, my dear. Cathy goes undercover, as usual, at the research station where a colleague of Steed worked (Frederick’s victim). 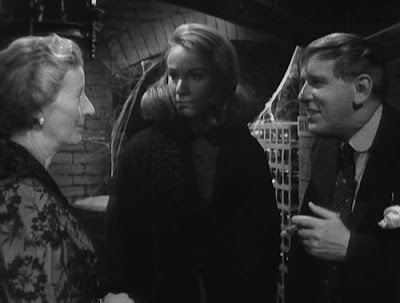 Marion (English) is working there, engaged in an affair with Allan, while her husband (John Ringham) remains oblivious; the villains’ aim is to steel plans, blackmailing Marion to cut the alarm system. Waller: He seems like a gentleman of some means. I think, he might brighten up the proceedings a bit. 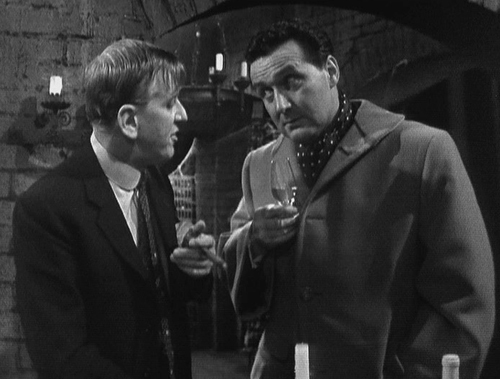 Steed’s interaction with Waller is a delight, as the former casually orders bottles of plonk and they discuss Rieslings and hocks. 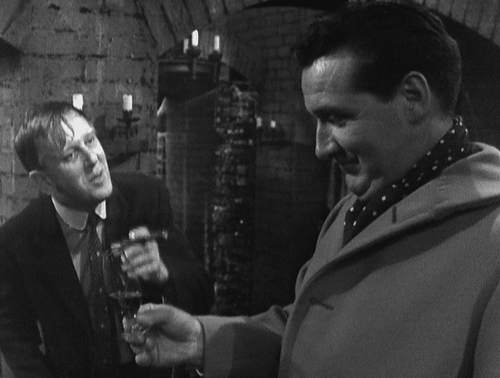 Steed arrives in the cellar for the showdown and, asked what the devil he’s doing there, advises he came for the wine list (“Oh, very droll” responds Waller). While fighting Steed warns “Mind the burgundy, Mr Waller” and is told “It’s a bad year, Mr Steed”. May comes across like a Peter Cook who can act, while given to the kind of hearty dialogue chewing that would make Iain Cuthbertson proud. The rest of the cast is also memorable, with English (previously in Mission to Montreal), offering a believably beset turn as a woman caught in an unenviable predicament and a loveless marriage. 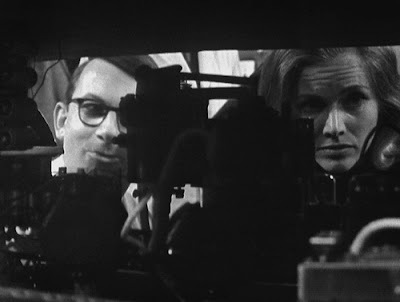 The scenario of spying through stagecraft rather recalls The 39 Steps (the Hitchcock version). Waller: Mrs Wilson and her daughter, Julia. Help yourself to anything you fancy, Mr Steed. Steed: (eyeing up Julia) That’s very generous of you. Steed is on particularly suggestive form, be it making innuendos about Cathy’s character or getting all Sid James over Mrs Wilson’s daughter. It must be all that vino (“Partaking of a few wines, in the company of Frederick Paignton” he informs Cathy: “What, again?” she responds wearily), particularly given the coda in which he and Cathy imbibe some of Waller’s cellar that got away.